By now, most fans have seen the trailer for Lightning Returns: Final Fantasy XIII and are at least partly aware of the new game system that will involve a limited time of 13 days in which Lightning must save the world. 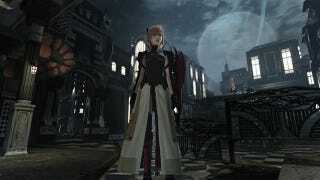 Video from the trailer shows Lightning in her new outfit running, fighting, climbing and leaping about in a city where the time of day changes as the game progresses. One thing people may have noticed from the battle scenes was that Lighting was fighting alone. While this could be because the game is still in development and other ally models and systems have not been completed yet, a bonus booklet included in this week's Weeky Famitsu seems to indicate otherwise: In the Final Fantasy Memoria booklet, the upcoming game is covered in depth with what information Square Enix has released. In FFXIII and FFXIII-2, there were parties of multiple characters, but this time Lightning is alone. This time, it's just Lightning, so it seems like the number of characters you control has decreased, but it still feels like you're fighting with a multi-character party. The battle system itself will involve a "style" system where players set up "styles," or combinations of weapons, shields, accessories, and abilities and can switch between them depending on the situation in battle similar to the Role system from the original Final Fantasy XIII, and Final Fantasy XIII-2. However, the Style system will theoretically allow for a greater level of customizability of appearance, performance, and abilities of Lightning. By defeating enemies, you will be rewarded with items to power up Lightning's equipment as well as points to extend her remaining time. Lightning Returns: Final Fantasy XIII is scheduled for release in 2013.